You are Tanner, a former racecar driver-turned-cop. Because of your past as a racer, you are sent on an undercover mission as a wheelman for hire in order to investigate the Castaldi crime family. The investigation will take you to Miami, Los Angeles, San Francisco, and New York, but before you can get these cities, you must take a driving test and prove that you have the skills to be a wheelman. A great getaway driver is only as good as his equipment, which is why Driver has a selection of performance-packed muscle cars, complete with realistic handling, damage modeling, and real-world physics reactions. One of the major obstacles to completing your goals is the cops; they don't know that you are undercover, and letting you pass would blow your cover. If being chased around keeps giving you fits, use the free-ride mode and explore any of the cities at your own pace. With Driver, you are the wheelman. I loved the first 2 Driver games. Very challenging and fun. Lukie Games has amazing customer service as well. The game they sent me initially was damaged during transit. All I had to do was send them an email and they immediately sent me another copy. This one worked perfectly. Highly recommended. 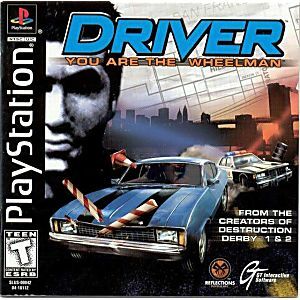 The best ps1 car game of yesteryear, and still holds up today. The graphics are dated, but the play and physics of the cars is unbeatable. A must have game if you like car driving games. Was waiting for the psn to get it like they have it in England, but better on disc anyway. Very happy with this purchase.